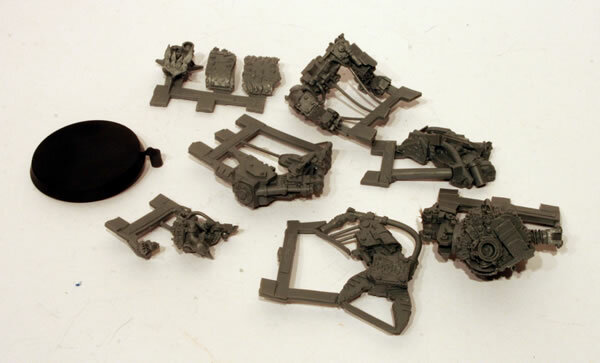 We also have an Ork, Speed Freeks, Feral Orks and Grots galleries in our Warhammer 40K Galleries. 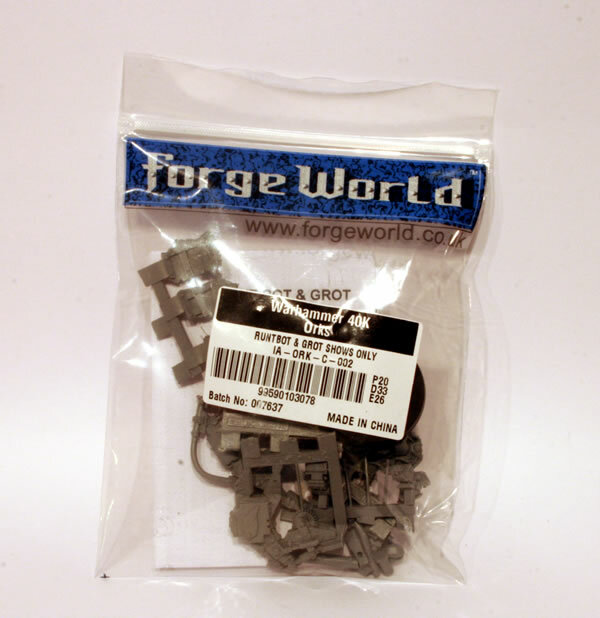 I picked up theForge World Runt Bot and Grot show only model at GamesDay 2010. This fantastic figure, designed by Mark Bedford, is our exclusive Event-Only figure for 2010. Meks are always keen to test their bionik designs on the battlefield, and if no suitable ‘patients’ are available they will build a Runt Bot; a huge, clanking parody of an Ork warrior powered by a rumbling engine and directed into battle by a plucky Grot, who will be provided with a ‘kontrol pad’ for the mechanical warrior. This finely detailed and striking vignette depicts the Grot controller perched precariously on the shoulder of the Runt Bot, wrestling with the joystick in an effort to direct the shearing claws of the monstrosity. This great miniature can be used to represent a Warboss with the Bionic Body upgrade, a Nob in Mega-Armour, or simply as a centrepiece or painting project. You do get a small bag of resin. Before I got started, I washed all the resin pieces.